The wingnuts are turning themselves inside out over the President of the United States of America being awarded the Nobel Peace Prize, and the insurance companies are turning themselves inside out over the possibility that Congress might force them to compete with a government insurance option. (How about we have Medicare for all?) So to keep my sanity, I have been watching mucho football–Did you see the fourth quarter of the Monday night NFL game between the Dolphins and the Jets? Wow! 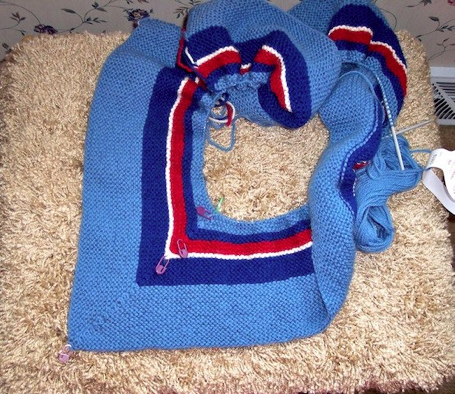 How exciting was that?–and knitting. So, where do I start? How about with the oldest of the three title projects, Gjende. 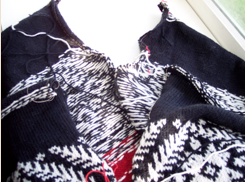 When last I posted, I had finished the second sleeve and was trying to work up the nerve to cut the armholes. About half an hour after posting my last blog entry, I opened the drawer of my computer desk, grabbed my mother’s blue-handled scissors, spread Gjende out in the bay window, and cut. 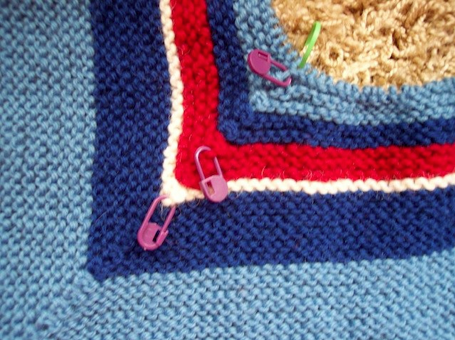 I was careful to be cutting only one layer of knitting and I cut slowly, making sure that the two rows of tiny machine stitches had caught every knitted stitch; they had. which is a 28-row cable, and I’m afraid the sweater is too small. 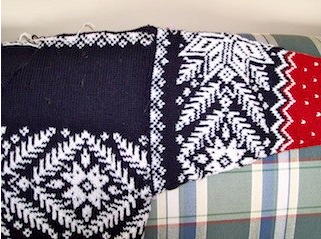 I did gauge swatches before starting the sweater, but the sweater just seems awfully small. So I’m going to bind off what I have completed, wash and block it, and then I’ll see. Sometimes cable knitting relaxes a lot once it’s washed. 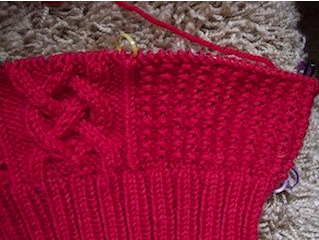 If St. Enda grows, then I can undo the bind-off and just keep going. 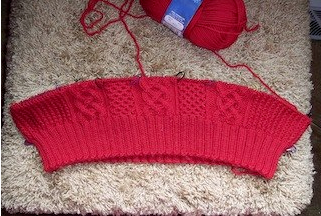 If it is too small, I’ll just look at my work so far as a big gauge swatch and I’ll start over. I think I’ll continue with the size needle I am currently using because I really like the fabric I’m getting and the look of the cable patterns. Even the filler stitch looks really good. If I move up a needle size, the fabric will change. So I’ll just add a few filler stitches to increase the size a bit. Of course, this is jumping the gun because it is possible that once the “swatch” has been washed and blocked, the size will be fine. Knitting St. Enda is hard on my hands. After a couple of hours, my hands start to ache. At that point, I put Enda down and pick up EZ’s ASJ (Adult Surprise Jacket). It’s totally mindless knitting, all garter stitch, and very easy on my hands. 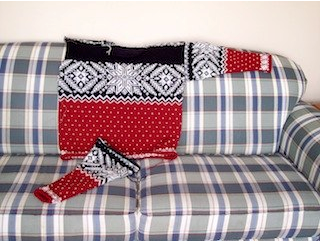 The Surprise Jacket is a kind of knitting puzzle. It doesn’t look like it’s going to be anything until it’s folded the proper way and the shoulder seams (which are the only seams) are completed. This is my first Surprise Jacket and I’m looking forward to seeing how it all fits together. Now for something entirely different and very exciting! It concerns my cyber-friend and fellow knitter Cindy, who actually reads my blog and posts comments. Cindy has herself completed Gjende and has encouraged me to finish mine. Thanks, Cindy. Anyway, the big news is that Cindy has won a contest with an original design. Details and a picture of the winning design are on her blog in the October 10th entry. Cindy lives in Texas but used to live very near to me here in southcentral Pennsyltucky. By near to me, I mean her house was only two or three miles from my house. But we’ve never met each other in real life, only in cyberspace. Cindy entered her beautifully designed and beautifully knitted baby blanket in a contest, and she finished first, deservedly so. The blanket is just lovely. Congratulations, Cindy!